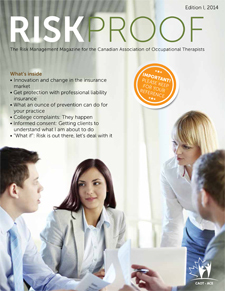 Over 92% of our members trust our Canada-wide insurance protection to help risk-proof their practice! For-member by-member insurance program. Full and cost-effective coverage that protects members 24/7 in all employment circumstances anywhere in Canada. Coverage is written on a claims-made basis and expires on October 1 of each year. More coverage for same low price! Option1 now includes $6,000,000 in professional liability insurance (not $5M) for only $59 per year. Option2 includes $10,000,000 in professional liability insurance for only $97 per year. Special rates for new members during the first two years after graduation. Enjoy 50% off in your first year and 25% in your second. Special rates for individuals on maternity/parental leave who will work less than six consecutive months during the membership year. Enjoy 50% off your insurance premium. Automatic seven- year extended reporting period for members discontinuing practice or retiring. For access to your current insurance certificate, login to My Account. Note: All options noted above are subject to the applicable Provincial Sales Tax: ON 8%, QC 9%, MB 8%, NL 15% and SK 6%.